Skimmed Cows' Milk with Added Plant Sterols, High Temperature Pasteurised. To learn more about heart health and how to lower your cholesterol and nutritional labelling, call the Flora ProActiv Careline. Plant sterols have been shown to lower blood cholesterol. High cholesterol is a major risk factor in the development of coronary heart disease. As heart disease has multiple risk factors, you may need to improve more than one to reduce your overall risk. †A daily consumption of 1.5-2.4g plant sterols can lower cholesterol by 7-10% in 2-3 weeks as a part of a healthy diet and lifestyle with sufficient fruit and vegetables. The amount of plant sterols in 3 servings is 1.62g. 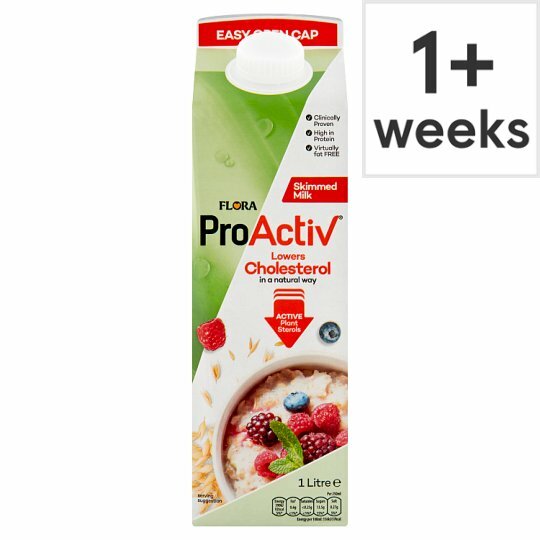 A250ml serving of Flora ProActiv Skimmed milk contains 0.54g More than 3g a day is not recommended. Store in refrigerator., Use within 3 days of opening., Not suitable for cooking., Use by: see top of pack. Check with your doctor first if you are already taking cholesterol lowering medication or if you have special dietary needs. Not suitable for pregnant or breast feeding women and children under 5 years. The product is not intended for people who do not need to control their blood cholesterol levels. Do not use if seal is broken.